Passport/Visa Requirements: US citizens need passports, but not visas. Time Zone: 1 hour ahead of Greenwich Mean Time (+1GMT). 6 hours ahead of Eastern Standard Time (+6EST). 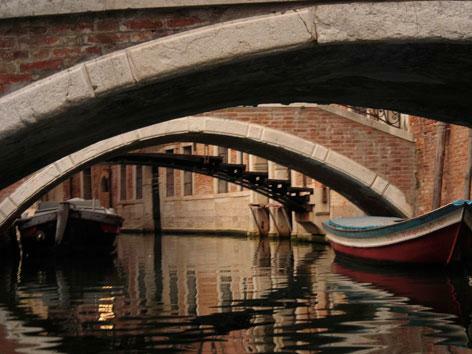 Built entirely on water, Venice has a magical charm that sets it apart from every other city in the world. Romantic. Mysterious. Provocative. Venice is all these things and more. From magnificent churches and palaces, to small bridges, narrow canals, and alleys that seem more like secret passageways, Venice offers a surprise around every corner. In fact, one of the chief joys of this city is simply losing your way in its labyrinth of streets. For all its fairy-tale beauty, however, Venice is also a vibrant, modern city packed with bustling cafés, zooming water taxis, and one-of-a-kind artisan shops. Venice is the setting of Thief Lord, one of my youngest son Ali's favorite books. The two of us toured the city together and you should have seen the look on his face when he saw the winged lion that comes to life in the book sitting atop the tower in Piazza San Marco. The Doge's Palace with its map room, armory, prison and famous "Bridge of Sighs" was also a big hit. As our family's most avid shopper, Ali had a blast hunting for mementos like small animals made of Venice's world-famous glass and those fanciful Venetian masks. Since we share a love for the theater, we made sure to see a play at the Opera House. And when it came to dining, the legendary Harry's Bar near Piazza San Marco won Ali's heart – he could have eaten every meal there. Last but not least, no visit to Venice is complete without a gondola ride. The gondolier even let Ali steer!